UPS plane crash: Birmingham residents describe "balls of fire"
BIRMINGHAM, Ala. A UPS cargo plane crashed into a field near the Birmingham airport Wednesday, killing two pilots and scattering wreckage over a rural area moments after witnesses heard the massive A300 jet coming in at treetop level. People living near the airfield reported seeing flames coming from the plane and hearing its engines struggle in the final moments before impact. The plane, which departed from Louisville, Ky., went down about a half-mile from Birmingham-Shuttlesworth International Airport and broke into several pieces and caught fire. The pilot and co-pilot were the only people aboard. Mayor William Bell, who was briefed by the city's fire chief, said there were two or three small explosions that authorities believe were from aviation fuel. April Odom, a spokeswoman for Birmingham Mayor William Bell, confirmed to CBS News that two bodies were found in the wreckage. Earlier, UPS spokesman Jeff Wafford said there were two crew members aboard the plane, and Bell said the two crewmembers on board were the pilot and the co-pilot. National Transportation Safety Board officials said investigators arrived on scene Wednesday morning. As of 5:00 p.m. ET, the tail of the aircraft was still on fire. First responders were working to extinguish the flames, so that investigators could safely retrieve the plane's black box and recorders. 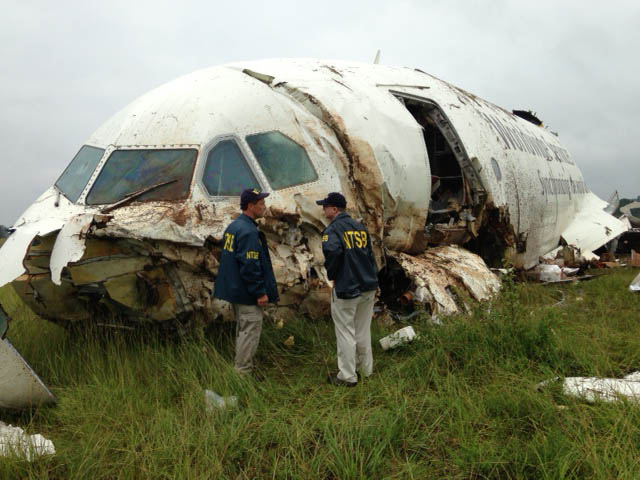 The plane had skidded about 200 yards on the ground after impact, NTSB officials said. Weather conditions at the time of the crash were rainy with low clouds. The plane's wings and tail was located about 80 yards away from the rest of the fuselage. Toni Herrera-Bast, a spokeswoman for the city's airport authority, said the crash did not affect airport operations, but it knocked down power lines and appeared to have toppled at least one tree and utility pole. UPS spokesman Jeff Wafford said the plane was carrying a variety of cargo, but he did not elaborate. The names of the crew were not immediately released. The National Transportation Safety Board sent a team of investigators to the scene. Chunks of riveted metal that appeared to be from the plane landed in the yard of Cornelius and Barbara Benson, who live just a short walk from the crash site. Barbara Benson said she was awakened by a tremendous boom and "saw a big red flash" through her bedroom window. As day broke, the two were able to see that the tops of trees around their property had been knocked down and they were missing a piece of their back deck. Cornelius Benson said planes routinely fly so low over his house that a few years ago, the airport authority sent crews to trim treetops. The planes come so close that Barbara Benson said she's sometimes been able to "to wave at the captains as they pass." "It sounded like an airplane had given out of fuel. We thought it was trying to make it to the airport. But a few minutes later we heard a loud boom." she said. James Giles, who lives just off the airport's property, said the plane missed his home by a couple of hundred yards, judging from tree damage and debris. He was at work at the time but said it was clear from the scene that the plane was attempting to land on the north-south runway that is typically used by much smaller aircraft. Large planes such as the A300 typically use the bigger east-west runway, he said. Wednesday's crash comes nearly three years after a UPS cargo plane crashed in the United Arab Emirates, just outside Dubai, killing both pilots.